Following the successful tour of “Following The Thread”, DIY Theatre company has begun devising another original touring show for audiences with Profound and Multiple Learning Disabilities. 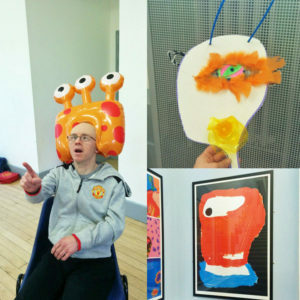 This time the theme is ‘Space’ and I have been in running creative workshops intermingled with their drama sessions to use design to help generate ideas and boost the devising process. In the drama sessions, they had been looking at packing for the trip and take off & landing. Together we made lists of what we might see out of the window once we took off. Firstly from take off to leaving our atmosphere then once in space. In two groups, they made simple two-sided stick puppets of some of the ideas. In the afternoon, they continued to work in their groups to draw backdrops using more thing from the lists. We put the backdrops on the wall and started to add the puppets. The following week in drama, they continued to work with these to create little stories and puppet shows adding sounds and movements. One of the highly successful elements in the previous show was the audience being able to handle some of the props. We thought it might be good to create some planets of different sizes and textures that could be passed round. In order to explore ideas, everyone made a textured planet using their own choice from a wide range of materials with different qualities, glued onto pizza bases. We looked at what these planets might be like to visit; climate, terrain, life forms? Knowing that in films when they visit other planets they often just stick a coloured filter over images of Earth, we explore the room, each other and the planets they had made while looking through different coloured cellophane. How did this make us feel? How did this change our assumptions about a place? In my final session this term we looked at who might live on the planets they had made. The group had been exploring and consolidating the character of their planet through drama. As a warm up, we passed around my inflatable alien head, taking turns to put it on and make an alien sounds for the group to copy. This connected with the drama exercises they had been doing exploring emotion & feelings through sounds and actions. We made a list of characteristic to think about when designing their alien: eyes, ears, mouth, skin, colour etc. They each made and decorated a flat card mask but with all the additions, they were anything but flat in character. I took a series of photos of each of them wearing their mask and holding their planet. It was really interesting to see them together and the relationship between them whether intended or not. I am looking forward to working with them further on this project in the new year.